Truck Accident Attorney Tulsa: Who Is Liable For A Commercial Truck Accident? Commercial truck accidents are often very different from a typical collision between two personal-use vehicles. Aside from the catastrophic damage that usually proceeds a truck collision, multiple parties are often involved other than the truck’s driver. If you were involved in an accident with a commercial truck, it is important you understand who these parties are and what roles they could have had in causing your accident. A Tulsa truck accident attorney can review your claim to determine which party involved with the commercial truck industry may be responsible for your accident. Call our team at The Edwards Law Firm today. There is a long process that a truck goes through before it is approved for road use and the driver assumes control of the vehicle. 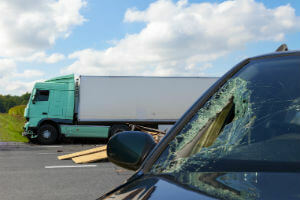 While a lawsuit stemming from a truck accident most often begins with filing a claim against the truck’s driver, the true cause of the accident may have originated long before the truck was dispatched for road use. Each party involved in the process leading up to the truck’s dispatch will attempt to distance itself to avoid accepting liability for the accident. Identifying the parties involved and their level of responsibility can be complicated for the average person. As reputable truck accident attorneys, we will investigate the cause of the accident and determine who should be held liable. Commercial truck drivers are held to a standard that demands them to be properly qualified and licensed to operate a commercial vehicle. The driver must hold a commercial driver’s license (CDL) that he or she obtained after completing the Federal Motor Carrier Safety Administration’s (FMCSA) requirements. According to the FMSCA, drivers of commercial trucks are 10 times more likely to cause an accident than other factors, such as weather, road conditions and vehicle maintenance. Commercial drivers’ behavior is heavily regulated by the FMSCA. This includes strict prohibitions concerning drug and alcohol use, particularly when a driver is operating a commercial vehicle. Federal regulations require trucking companies to test their drivers for records of alcohol or drug violations before making a hiring decision. Trucking companies are also required to submit drivers to periodic random drug and alcohol tests while they are on duty and after a fatal accident. Drivers cannot refuse any controlled substance test required of them. If a driver refuses to submit to a controlled substance test, he or she can no longer perform safety-sensitive functions. If a driver tests positive for a controlled substance or an alcohol concentration over .04, he or she can be held liable for any damages caused by a collision. A driver’s operating schedule is federally regulated by the “hours of service rule,” which limits the number of hours in a day that he or she can drive. Property-carrying drivers, like truck drivers, can drive a maximum of 11 hours after 10 consecutive hours off duty. Drivers of long-haul trips must log their sleep schedule and cannot resume driving unless they have taken a rest break lasting eight hours. A driver also cannot operate a commercial vehicle after remaining on duty for 60 hours in a consecutive seven-day period or for 70 hours in a consecutive eight-day period. If a driver has reached this limit, he or she must take at least 34 consecutive hours off duty before resuming driving. Trucking companies must be sure that a driver has followed this schedule. In order to prove that a company violated an hours of service rule, you should obtain a copy of the driver’s log. Federal law requires that drivers account for every hour of operating and break periods. If you suspect driver fatigue was responsible for your accident, a driver log will provide evidence to confirm or disprove this. You will need to collect definitive evidence to prove that your accident was caused by an error made by the truck’s driver. Our truck accident attorneys are experienced with commercial vehicle accidents and will be able to determine which type of error may have been responsible for the collision and what evidence is necessary to prove it. Learn about common injuries caused by truck accidents here. The two most common reasons for truck accidents caused by mechanical failure are defective brakes and tires. The FMSCA has strict guidelines and regulations concerning the brakes for commercial vehicles, which must meet specific standards before receiving federal approval. A commercial vehicle’s brakes must be able to develop a specific braking force based on a percentage of the truck’s weight. The truck should also be capable of decelerating from a stop of 20 mph at a rate specific to its size and must meet the requirements of the automatic brake adjustment system. If the brakes of the truck involved in your accident do not meet these standards, the manufacturer can be held liable. A trucking company can be held liable if you can prove that it deliberately tampered with or failed to maintain the brakes. The FMSCA requires trucking companies to keep records of all maintenance performed on vehicles, including brake adjustments and repairs. A trucking company must uphold the FMSCA’s maintenance schedule and drivers are required to perform daily pre-trip inspections of the truck or trailer equipment. Defective tires can be sold by manufacturers and cause accidents when they malfunction. The Department of Transportation often issues recalls and maintains records of all recalls on its website. If the truck involved in your accident was equipped with recalled tires, you may be able to file a claim against the manufacturer. Trucking companies often make mistakes concerning the federal requirements for commercial vehicle tires. If a trucking company fails to meet the FMSCA’s standards or neglects to perform periodic inspections of tires to ensure quality and performance, it can be held liable for an accident caused by tire failure. A trucking company may attempt to distance itself from the accident, claiming that the driver’s error or the defective vehicle is not its responsibility. However, trucking companies are often more liable for accidents than they portray themselves to be. In order for a trucking company to be held liable for an accident, the driver must have been an employee of the company, not an independent contractor. Trucking companies often hire independent contractors because they are not liable for any wrongful actions he or she might commit. Our truck accident attorneys will request the driver’s employment record to review his or her status with the company and the terms under which he or she operates the truck. If the trucking company has control over the vehicle or dictates the manner and means in which the driver’s work is performed, the driver is an employee and the trucking company is liable for his or her actions. Trucking companies may also attempt to avoid liability by claiming the truck involved in your accident is not officially owned by the company. The truck may be owned by a leasing company, which is responsible for any maintenance and inspections required by the FMSCA. If you are attempting to file a claim against the trucking company, you will need to determine which party claims ownership over the vehicle. We can do this by requesting copies of the truck’s registration records and any transaction documents that detail either ownership or leasing agreements made between the trucking company and the truck’s owner. Trucking companies must follow the rules and regulations concerning drivers and vehicle maintenance established by the FMSCA. The trucking company cannot impose unrealistic deadlines on drivers that interfere with the federal hours of operation. A trucking company must also comply with all maintenance requirements, approved vehicle parts and inspection deadlines required by federal regulators for any commercial vehicle it owns. If a company has violated any federal or state regulations, it could be held liable for your accident. If you or someone you love has been in an accident, you may be able to file a claim against multiple parties to maximize your compensation. The Tulsa truck accident attorneys at the Edwards Law Firm will conduct a free review of your claim to determine which party was responsible for the accident. We will investigate each party involved in your truck accident and determine everyone who can be held liable. All legal and investigative work committed on behalf of your claim comes at no cost. The only time we charge our clients is if we recover fair compensation for their claim. Do not hesitate to contact us for experienced legal guidance after a severe truck accident — call our team of personal injury lawyers today.